There was never a doubt in our minds that Battlefield 3 would be the best example of a game about warfare in a modern setting in 2011, and the day it finally hit the shelves in November all that anticipation could finally be put to rest. Despite it’s somewhat patchy launch, the game itself was fantastic. Dice’s now famous Frostbite engine is looking better than ever, and we have been given the grandest of fields to battle in – one filled with all the tanks, jets, humvees and attack helicopters we could ever wish for. It’s all about the war stories. Remember the time we defended the hilltop in Caspian Border with a single infantry squad? Or how about the time we defeated that platoon of tanks using nothing but javelins and a small ammo crate? And remember the time we assaulted the mining base at Damavand Peak by flying a little bird through the tunnel? We do that a lot actually now I think about it. The thing about the Battlefield games is you can join literally any online game and something truly spectacular is almost always guaranteed to happen. It’s just the way it goes. Helicopters and jets are frequently blown out of the sky in a fireball that can be seen from the other side of the vast maps, and their burnt out husks like to rain down inches from your face. The most common thing you’ll hear over voicechat is some derivative of “HOLY CRAP DID YOU SEE THAT? !” We are lucky enough to have a small group of friends to play the game with and so there’s always a few witnesses to any of the heroics that occur, and talking about them after the game is over contributes greatly to the reasons we have enjoyed it so much since its release. 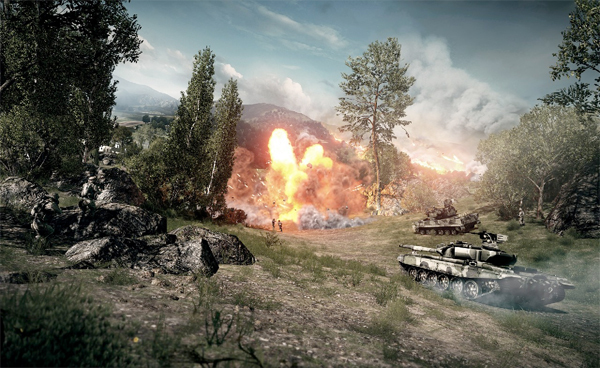 When it comes to creating glorious war stories, Battlefield 3 has no competitor. This social aspect of the game expands to the new Battlelog system, which is a fun way to compare kill counts and see what else you need to do to unlock that elusive new gun. Its not something I particularly cared about before, but can’t deny the sense of achievement it adds to the overall experience. For me, I can tolerate a few minor annoyances with the way a game is presented (Origin, I’m looking at you) so long as the game itself gives me the thing I want. And what I want from a game of Battlefield is squad-based teamwork and unscripted moments of pure chaos and destruction. And that’s exactly what Battlefield 3 gives me. Ever since the Battlefield series made its debut back in 2002, I’ve never enjoyed any other war game, or even multiplayer game, nearly as much. Being able to join your friends online isn’t exactly a premise unique to Battlefield 3, but what really does feel unique and absolutely done to perfection, as per its predecessors, is its ability to make you feel like a part of something more than just an arcade shootout with bunny hopping and dual-weilding sawn-off shotguns. Whilst the single player being overshadowed in many reviews by that of ‘it-which-must-not-be-named’, we had fully accepted from the outset that Battlefield’s strength does not – and never has – reside in its single player. While the graphics and visuals are utterly spectacular across the board for Battlefield 3, with lighting, models, and textures being incredible down to the finest detail, it’s no secret that the various and highly competitive team-based multiplayer modes involving infantry, jeeps, tanks, boats, planes and helicopters are what make Battlefield stand out from the crowd. Who needs an automatic air-strike support package when you can scream down the microphone to your buddies for air support when that heavy machine gunner has you pinned down behind a rapidly crumbling wall. For me, nothing has ever come quite as close to the feeling of excitement in a video game than when a jet come screaming overhead, releasing its payload into the flank if enemy armour, sending it straight to hell in a ball of flames and flying metal, and all the while knowing that it wasn’t scripted, wasn’t automatic, and was actually piloted by another player in the world who has put time and effort into becoming a brilliant pilot for situations just like this one. Battlefield, like all the best games out there, has always been a franchise that gives us amazing memories to share and reminisce about with friends, but, unlike most other games, the maps of Battlefield are typically so huge and open that the amount of amazing stories we can end up with are nigh-on limitless. In one moment you could be shooting from the side of a helicopter, helping the guys on the ground to capture a control point, and in the next moment you’re free-falling away from a smoldering wreckage that used to be a chopper, pulling your parachute at the last moment, and then by absolute chance, you land on the very top of a radio antenna, yelp in utter glee “What are the chances of THAT? !” and attempt to get as many kills as possible before that sniper sees you precariously balanced on the edge of a radio mast. Granted, these events are the least realistic you can imagine from a first-person-shooter, but that freedom to accidentally pull off the most impossible Arnold Schwarzenegger action hero moments in the midst of a huge battle is what makes Battlefield one of the most memorable games I’ve ever played, and I’m pleased to say that even four months since release, I still play it almost as much now as I did at release. 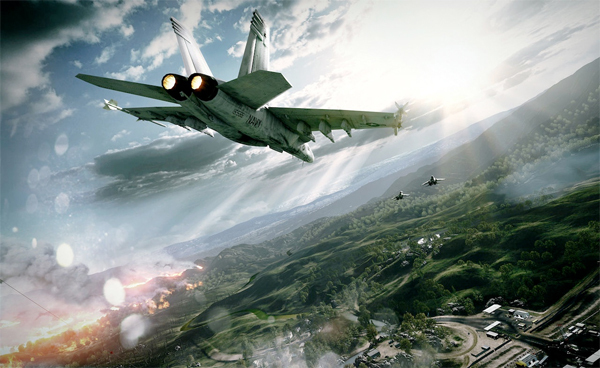 This entry was posted in Features and tagged battlefield 3, Top Ten Games of 2011. Bookmark the permalink.